Are you interested in giving your smile a full makeover? Porcelain veneers are an excellent cosmetic method for achieving comprehensive improvements, as they are designed to cover the visible surfaces of natural teeth all at once with an attractive and functional replacement. Misshapen teeth, stubborn stains, gaps, crookedness, cracks – all of these flaws and so many more can be beautifully corrected! Our 21st Century dentists look forward to getting started, so don’t hesitate to contact the practice in Las Colinas, TX for a consultation. 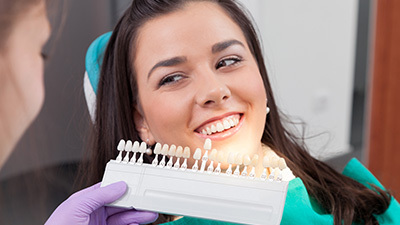 Why Choose 21st Century Dental for Porcelain Veneers? Have you ever wished you had better-looking teeth without all the hassle of braces (orthodontics) or crowns (caps)? NOW YOU CAN! Porcelain veneers are the answer for instant orthodontics to straighten smiles, close spaces, reshape, and accomplish minor realignments of your teeth. You can even have that "Hollywood" smile you've always wanted. If you are concerned about what porcelain veneers cost, we think you will be pleasantly surprised. A free cosmetic consultation is waiting for you! 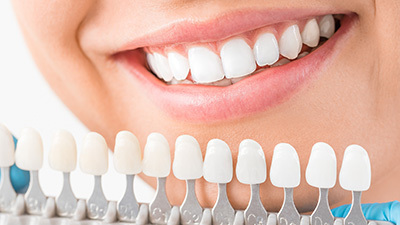 Veneers are very thin and are bonded on the front of your anterior teeth. These veneers are about 0.3mm to 0.5mm in thickness but have a durable functionality once bonded to your teeth. Their lifelike appearance combines with the strength, beauty, and durability only porcelain restorations can afford. 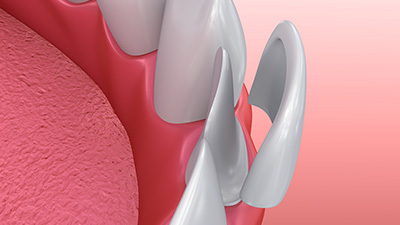 Veneers have several advantages over crowns (caps). There is no "dark line" that is sometimes seen with older front caps. They transmit light better and, therefore, have a more translucent appearance that results in a natural, esthetic look. Veneers do not require the massive grinding of tooth structure that caps do and accomplish a beautifully gorgeous final result. What Can I Expect During a Porcelain Veneers Procedure? How's it done? After a thorough discussion with us to establish just what you wish to accomplish AND establish what can or cannot be done, your first appointment usually involves some minor contouring of the front teeth and taking an impression of the teeth. The veneers are placed and, if satisfactory, bonded in place. A follow-up visit is made in a week. The results are instant and spectacular! Many times, we combine whitening with porcelain veneers to make that perfect smile. If some front teeth are already badly broken down, we can place new, all-porcelain crowns combined with veneers and other cosmetic techniques. In most cases, we can give you that smile you have always wanted.